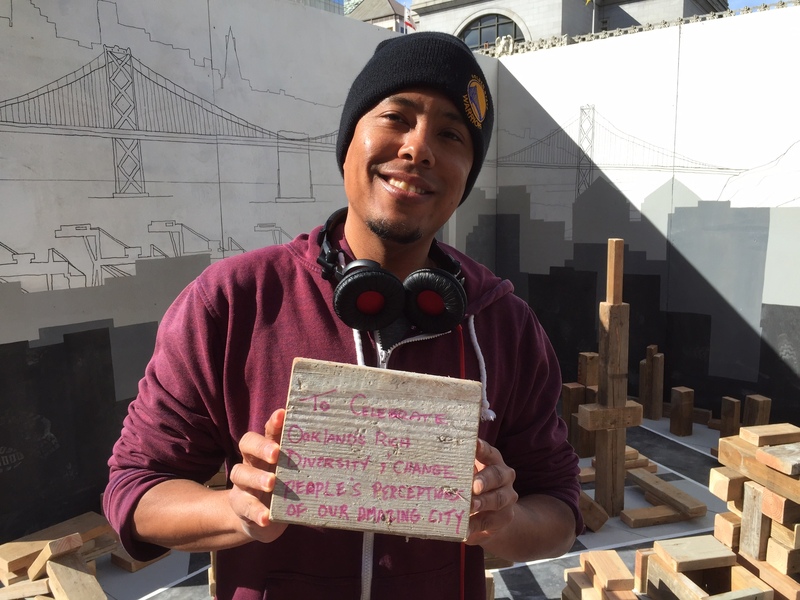 Block by Block engages people off the street and asks them to participate in Oakland’s future on two levels. 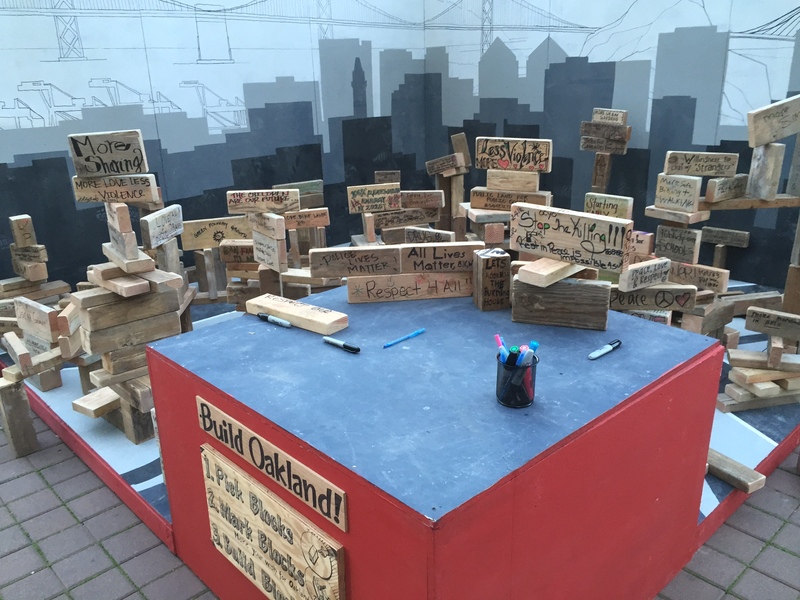 Firstly, passersby will be encouraged to make a wish for Oakland’s Future by writing a note on a wood block. This note could be a wish, a dream, a problem solved, or a defining characteristic of Oakland now or in the future. 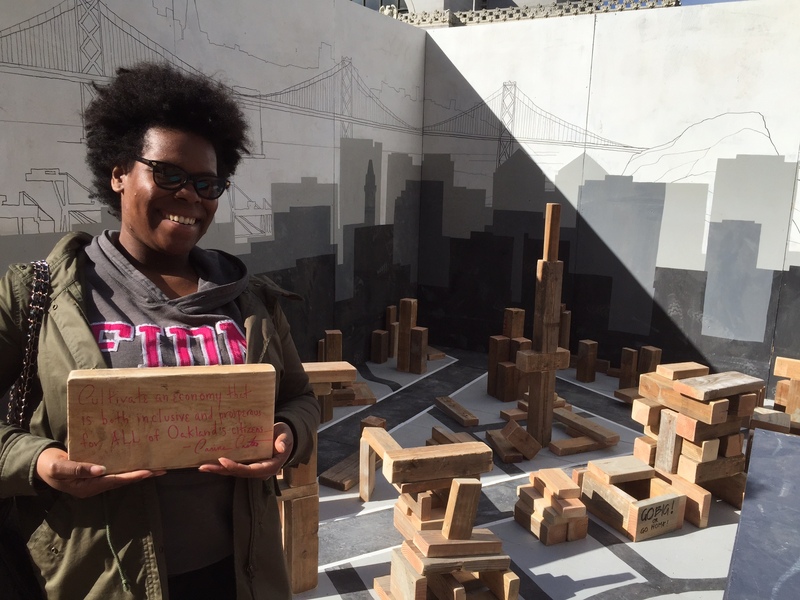 Secondly the participant will be encouraged to consider the physical fabric of the city as they are prompted to place their wishing block, as if a scale model, on a platform painted with Oakland’s street grid. 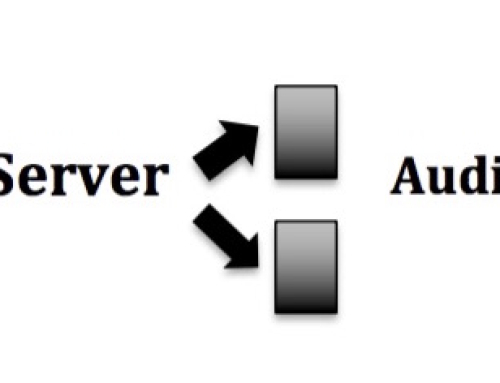 In placing their block they will have the choice to harmoniously add to what has come before, to be bold and different, to take a small part in a larger whole, or to stand out as unique. Over the course of three days people will have the chance to interact with Block by Block as they wish, sometimes complying with the prompts and having a bite sized impact, and possibly ignoring the prompts to change the ‘city’ in larger than life ways. 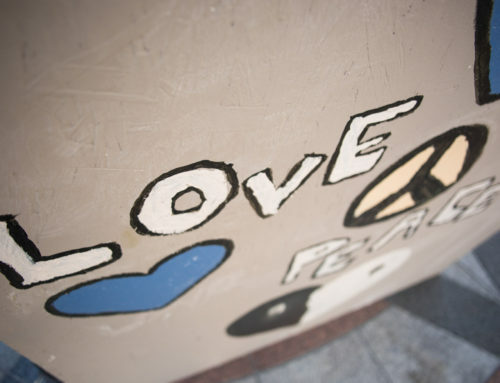 A hidden camera will be used to record the building block constructions, and the written notes will be compiled at the close of the Our City fair. The resulting video and notes will be presented to the City’s ‘Plan Downtown’ team for potential inclusion into their in-progress Downtown planning effort. 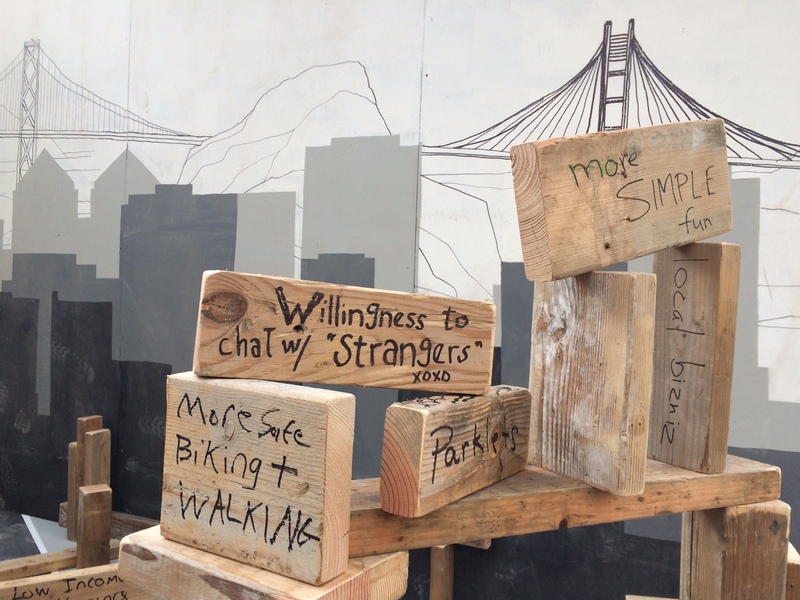 The setting for this playful experiment is a 10’ x 10’ wooden platform with two 10’ x 10’ walls. 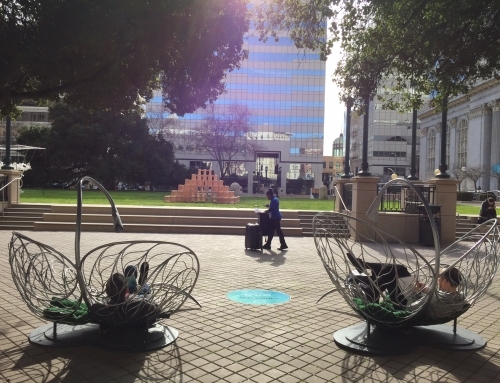 The two walls will be designed to imply Oakland’s skyline, and will contain the written prompts and tethered writing supplies. The platform’s floor surface will be painted with downtown Oakland’s street grid, and will be minimally raised from the surrounding ground. 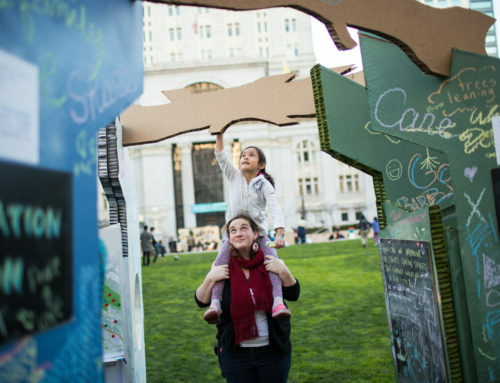 The Fair will open with a dense layer of precut wooden blocks arrayed on the platform, and end with a record of Oakland’s collective thoughts and dreams for the future.